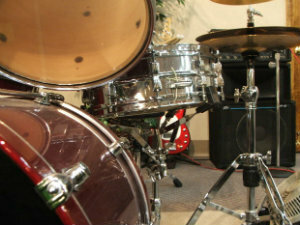 Chiropractic helped our patient get back to life behind her drums! By Dr. Robert Cummins – As a chiropractor, I see patients who have been deeply affected by injury and discomfort. I want to share with you a recent success story showing the power of chiropractic care for a local musician. I have been providing chiropractic care to a woman in her forties who works as a dental hygienist. She also plays the drums in a percussion band. She came in to see me for chronic neck pain. For years, her ability to play drums has been compromised. Each time she would move her arms to strike the drum, her neck muscles would be activated, giving her that same old pain. It became worse during the summer months when she would participate in different area parades. This patient came in to see us about six months ago. She told us she had seen many other specialists to try to cope with the pain. She wanted to get back to playing the drums and working in her job as a dental hygienist without pain. Like many of our patients, she had not seen success from these other doctors. That was where she was at nearly half a year ago. Now, for the first time, she can play the drums without pain. She feels the best she has felt in years! Chiropractic has gotten her to a place where she can do what she wants. She works at her job without pain and plays in the band without worrying about her neck hurting. Chiropractic can help you get back to your family and living the vibrant life you deserve. Give us a call today and find out what we can do for you!